62 x 28 7/8 inches (157.5 x 73.5 cm)Collection of Fred and Sherry Ross, USA"A young shepherdess stands challenging the viewer, staff in hand. Bouguereau used a play on words when naming this painting, for the shepherdess is not only standing up, but also standing her ground, made evident by her bold and confident look. When the title is read in its original French form, it reads Jeune Bergere Debout. The use of 'debout' adds an additional play on words to the meaning, as it is very similar to the word 'debut', meaning a first prominent public appearance. In the late 1800's the word was commonly associated with the debut of a debutant. Bouguereau is saying quite clearly here that this young shepherdess is just as good as any debutant from high society, and is once again elevating the lower class to equality with that of the aristocracy." Beautiful, original hand-painted artwork in your home. Interpreted paintings based on the masters' works of William Bouguereau.This Young Shepherdess Standing needs about 14 - 16days for production by a talented artist. If you're not happy with William Bouguereau Young Shepherdess Standing that you made on PaintingHere.com, for any reason, you can return it to us within 50 days of the order date. As soon as it arrives, we'll issue a full refund for the entire purchase price. Please note - PaintingHere.com does not reimburse the outgoing or return shipping charges unless the return is due to a defect in quality. If you want to purchase museum quality Young Shepherdess Standing at discount price, why not give us a try? You will save a lot more! 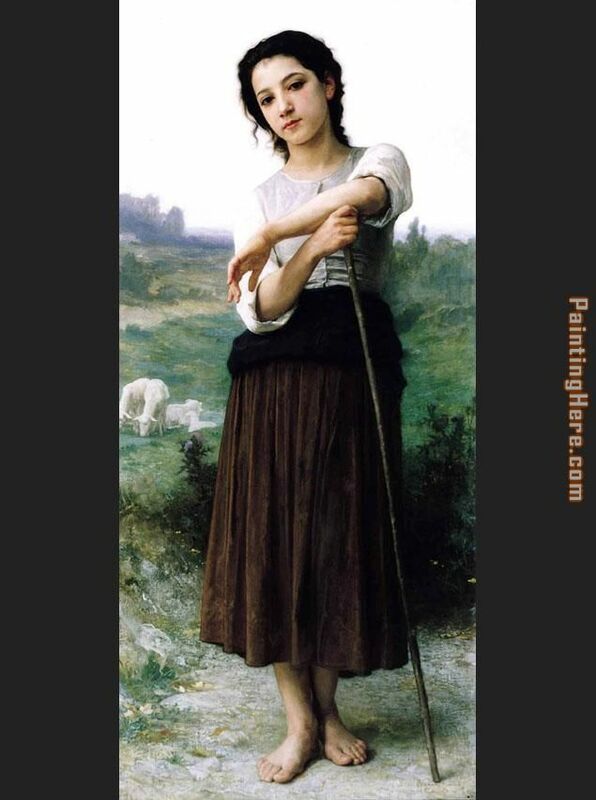 This William Bouguereau Young Shepherdess Standing needs 14 -18 days for production time frame. We ship all over the world. We can provide Young Shepherdess Standing Painting stretched canvas and large framed art.